Joe's Radio Shop is proud to present this amazing 1935 Zenith S-829 "Chrome-Front" radio. There were three models offered by Zenith in 1935 that utilized chrome grilles. The cabinets were designed by Chicago-based industrial designers, Rosenow and Company, who also designed the Grigsby-Grunow Majestic "Smart Set" radios. This explains the likeness of the Zenith S-829 to the Majestic 161 "Chrome-Front." The second series S-829 has an improved circuit with triple-filtering. The shortwave was increased from 12mcs to 16mcs over the earlier model 829. The restoration is "top shelf;" all of the wax/paper capacitors have been replaced with the new epoxy coated caps of equal values. The tubes and resistors have been checked and replaced as needed. A precise alignment was done, a safety fuse was installed, and a cable added to plug and play your own device. Gary has professionally refinished with the finest lacquer, toners and grain filler for a factory-like finish. The grille has been re-chromed and the knobs are a perfect reproduction of the originals. 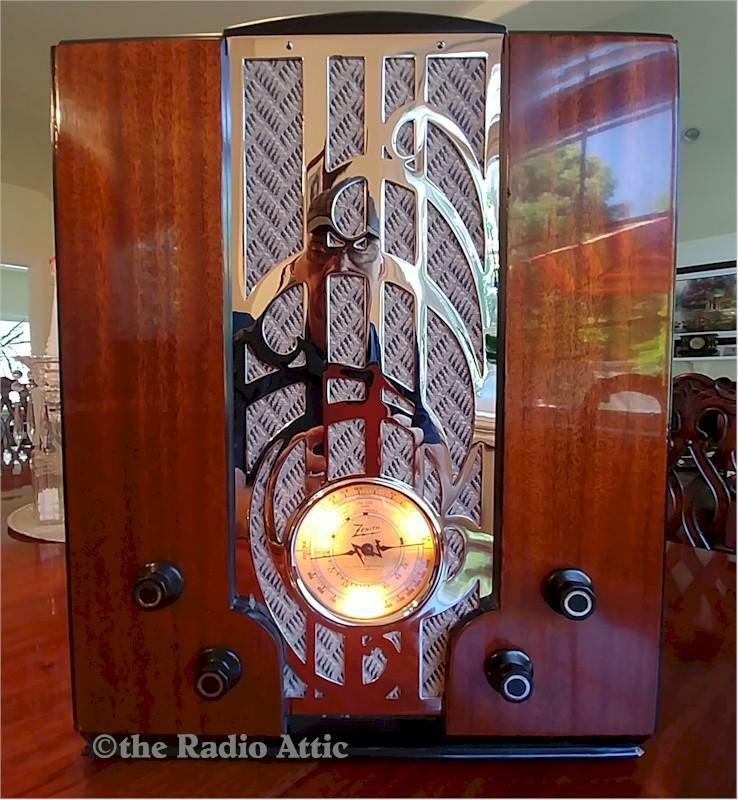 Don't miss this opportunity to own one of the most beautiful, rare and collectible radios made! 18-5/8"H x 15"W x 8-1/2"D.
You are visitor number 1,195 to this page.